What a fine mix of reprobates we've seen to date in the 'Choose Your Own Adventurers' project. 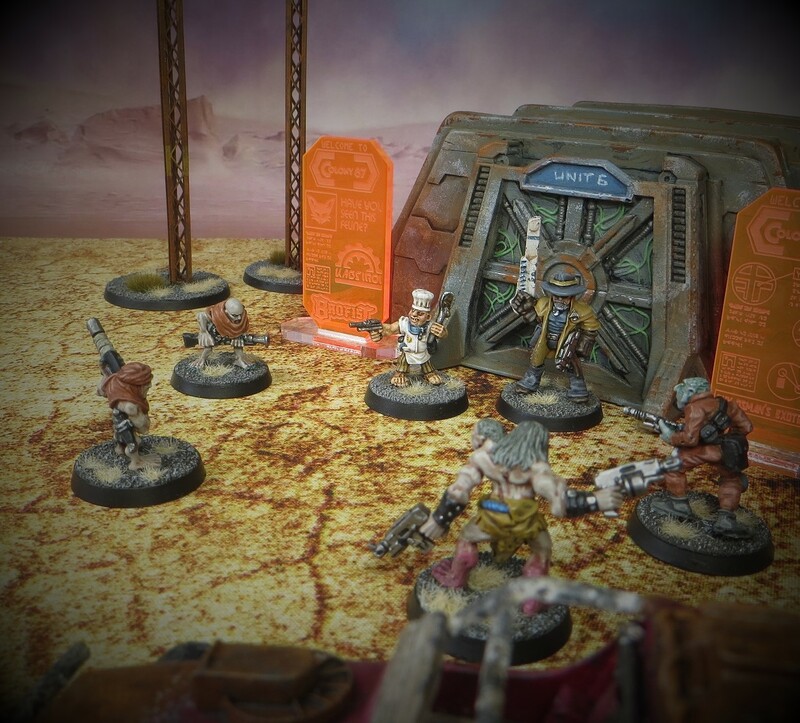 I urge you to check out Captain Paradox Zeeman by Curis, and Garnier Wangst, Eldar trader by cheetor. My second contribution is a shorter, nastier piece of work. 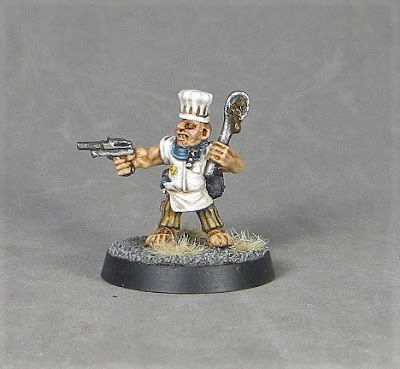 And that pretty much sums up a ratling cook - a greasy low-life responsible for acquiring supplies needed to feed his crew. I suspect those supplies may not always be of the highest quality! 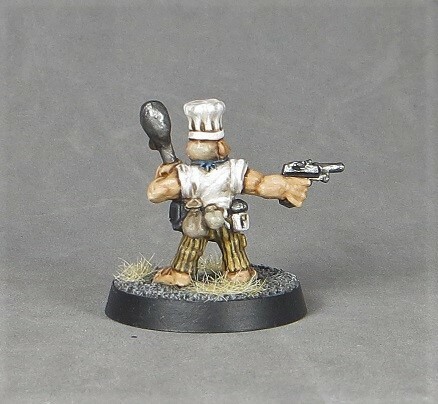 I elected to give Short Jern Silvo traditional chef whites and stripy trousers, which kept the paint job pretty simple. 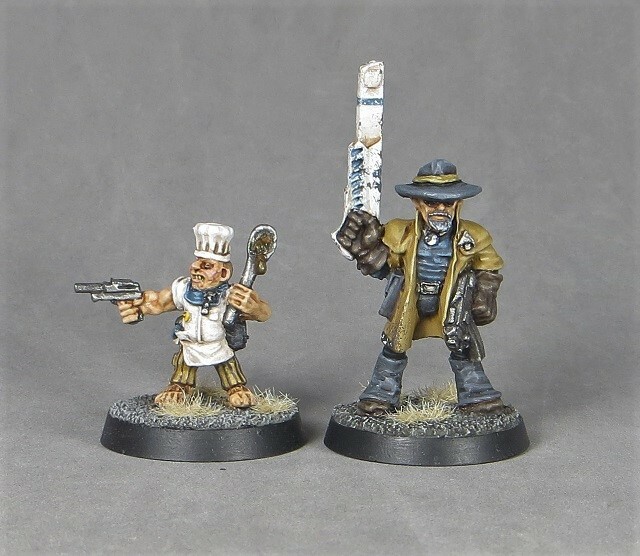 Like many Rogue Trader sculpts, the figure is all about the character, rather than the execution of the sculpt. Which leaves some rather tricky areas to navigate - just what is the thing hanging from his cravat? What about the blobby stuff on the spoon? I rendered them as a sort of brooch / tie-pin and...blobby stuff on the spoon! 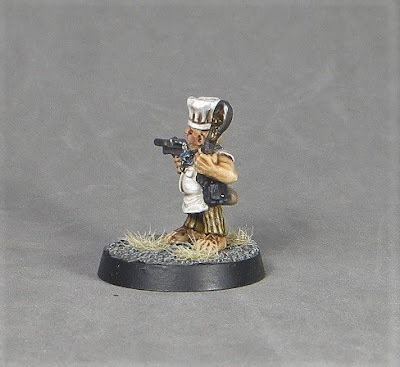 My approach to selecting my first mini-set from the Adventurers range is to create an Inquisitor with his personal retinue. 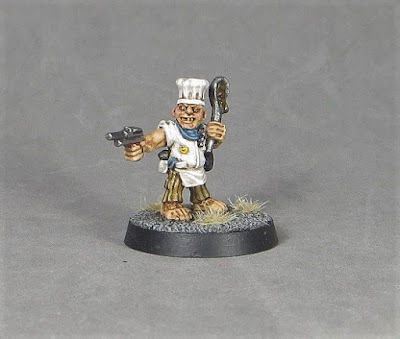 Short Jern Silvo is therefore the first recruit to Inquisitor Clousseau's team. I'm looking forward to revealing which of the other Adventurers will make the cut! Emerging from a remote hick bar, it seems that some of the locals want a word. "What did you say to them this time Silvo?" Brilliant, the 2 of them side by side really have that right look for gamming comedy gold. 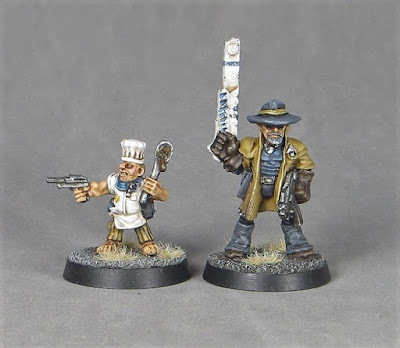 I'm having visions of Basil Fawlty and Manuel in the 41st millennium! That guy has star quality. I Like the striped trousers. 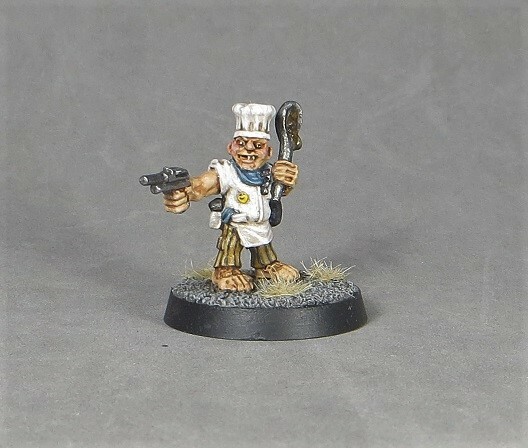 One of the more memorable Adventurer sculpts for sure. Thanks cheetor. He really is one of the adventurer sculpts that wouldn't fit in any other range, and is all the more endearing as a result I think. I've always loved the whimsy of this little guy ever getting sculpted - sums up RT perfectly for me :-) Nice job dude! I know what you mean. He fits the RT setting thematically...perhaps the RT setting fits him too? Thanks! Did you go with striped trousers to have a pirate vibe? Nice work. You've timed this post to coincide with Games Workshop putting the Halfling Hotpot Chef back on order too! I'm fully on trend I see - no coincides, honest! The stripes were really just for visual interest. And stripes are cool. I must get a pair of mustard yellow striped trousers. Love 'im - exactly the kind of characters I love to see. I love how tight you keep your palette - 90% of your minis are individuals but I bet you can assemble any of them into a faction at will? And that tasty terracota colour you use sometimes - I love it! He's a greasy little piece of work. And a jolly fine one too. Yeah, very fun sculpt and painted up to your regular standards! Stripey trousers really do win with me.